Bengaluru: ‘Ananta Volume 1 – Maestros of India,’ the official submission of The Art of Living has been accepted for consideration for nomination in the upcoming 60th Grammy awards as a ‘World Music Album’ & one of the tracks, Guru Stotra, composed by Pt. Vikku Vinayakram featuring 3 successive generations, Selvaganesh Vinayakram and Swaminathan Selvaganesh featuring Siddhant Bhatia on Indian Classical Vocals has been entered for the “Arrangement – Instrumental and Vocals” category. Ananta was recorded in just 33 days. Producer Siddhant Bhatia, traveled across the country and single handedly employed traditional forms of live performance recording without electronic music production support. The intention was to capture the magical moments in short studio sessions. Almost all music tracks were composed and created spontaneously. Ananta, while being experimental, maintains the sanctity of Indian music in its true, classical spirit. “Ananta”, (sansrkit for Infinity), the world’s largest compilation of original Indian music features 30 legendary maestros and over 300 minutes of Indian music. The music album features Grammy award winning musicians such as Pandit Vikku Vinayakam on the ghatam (percussion), Pt. Vishwa Mohan Bhatt; senior Violinist and Grammy winning composer Kala Ramnath and many Grammy-nominated musicians such as U Rajesh on the Mandolin, Pandit Tejendra Narayan Majumdar on Sarod. Legendary exponents such as Pandit Jasraj, Aruna Sairam, Ustad Shahid Pervez Khan, Ustad Rashid Khan; Oscar winning Bombay Jayshree of the Life of Pi fame and young maestros like Purbayan Chatterjee on the sitar, Kaushiki Chakraborty on Vocals, Rajhesh Vaidhya on the Veena and Rakesh Chaurasia on the flute; Bollywood magicians like Hariharan, KS Chithra and Javed Ali; all musicians present a taste that is hard to forget. “The album offers music for every taste. From Rumi’s couplets to devotional songs in praise of the mother divine, and intense meditative chants blending with heavy percussion. The music is set to take the listener to a state of bliss and that of inexpressible joy,” says Siddhant Bhatia, the album producer. 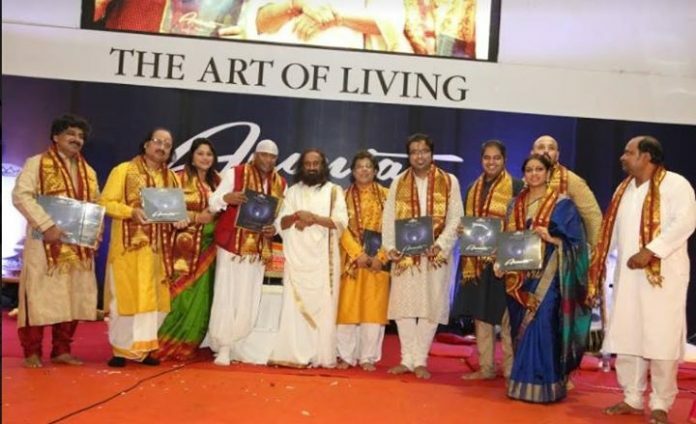 Proceeds from the sales of the album are channelized towards the internationally acclaimed ‘Gift a Smile / Care for Children’ program by the Art of Living where more than 58,000 underprivileged students are provided free education in 435 schools around India. Inspired by the vision of the Art of Living’s founder, Gurudev Sri Sri Ravi Shankar, Ananta, is also a channel that seeks to bring the world together through the power and magic of music and of universal love. It is a way to preserve the grand tradition of Indian classical music.